The section extends from the Transportation Research Center, an independent testing facility in East Liberty that is the claimed largest autonomous vehicle proving ground in the United States, to the Ohio Super Computer Center in Dublin, a laboratory that serves as a resource for university researchers and industry partners. In December 2016, ODOT tested a self-driving truck along the corridor, with a driver in the cab to intervene if necessary. Barna said ODOT will test more autonomous technology as research continues. ODOT has already installed 432 strands of fiber optic cable along the corridor to foster communications between roadside units and passing vehicles. The $3.5 million cost of the fiber project was covered by Ohio’s state and federal motor fuel tax, ODOT spokesman Matt Bruning said. The roadside units can send alerts to properly equipped vehicles about hazardous conditions or possible delays. According to Barna, many high-end cars already have the two-way technology. “With this technology, a vehicle is going to be able to provide us a lot of information about roadway conditions and traffic at any given point. If you get a warning through anti-ice technology, that message will go to ODOT,” Barna said. 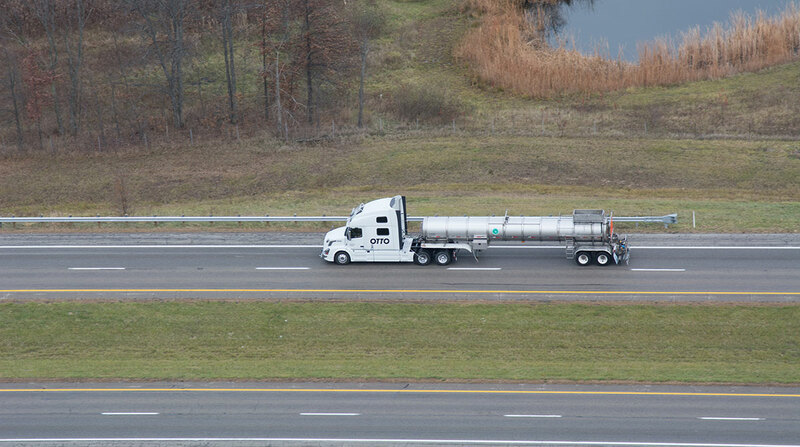 While U.S. 33 is important for freight carriers moving between Indiana and West Virginia, Barna acknowledged that it carries less truck volume than Interstates 71, 80 or 90, which run through Ohio. However, its lack of freight congestion makes U.S. 33 an attractive site for testing connected vehicle technology, he said. “The location here in central Ohio, especially from the testing perspective, makes it a great option because central Ohio is such a huge freight and logistics hub for the whole eastern part of the country,” ODOT spokeswoman Erica Hawkins said. Ohio Trucking Association President Thomas Balzer commended Ohio’s smart technology research, but said the state should balance technological funding with infrastructure needs. Balzer said that he supports driver-assistance technologies such as adaptive cruise control and crash mitigation technologies, and said most trucking companies latch on to these sorts of devices in a world of rapidly developing technology. He noted that many trucking companies in Ohio receive messages from GPS systems or satellites, but do not use in-cab vehicle-to-infrastructure communication devices.